This bar has almonds that have been roasted to intensify their flavour even more, with their skins left on for an extra nutty taste. Cocoa is a source of naturally occurring antioxidants called polyphenols. Scientific research shows that polyphenols may be beneficial for health. They have been linked with protecting the body from future diseases like heart disease and cancers. Cocoa polyphenols are some of the most well-researched polyphenols in the scientific literature. Just a small amount of cocoa per day has been shown to help relax the arteries and reduce blood pressure, have an effect on blood clotting and protect against inflammation. 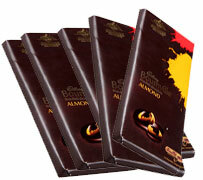 Cadbury Bournville is rich in cocoa and cocoa polyphenols. Cadbury brings to you the smooth, fine and intense experience of Bournville Fine Dark Chocolate. We take the best cocoa beans sourced from Ghana, grind and roast them with utmost care, to give each bar of Bournville its characteristic bittersweet taste. With 44% cocoa in each bar, this dark chocolate is a natural source of anti-oxidants and contains high levels of flavanols and other polyphenols that are good for you. So what are you waiting for? Bite into Bournville and enjoy the release of the distinct bittersweet flavour. The smooth texture and luscious aroma heighten the pleasure of the experience.